Skills for the Future are those skills which will allow us to effectively and ecologically define, move toward and manage the future amid the challenges of uncertainty and change. The two basic goals for developing skills for the future are to 1) improve performance and 2) manage change. Reaching these objectives involves competence in such areas as learning, leadership and, perhaps most importantly, creativity. The focus of this book is on how the cognitive and behavioral technologies of Neuro-Linguistic Programming may be used to develop and apply personal and organizational learning strategies together with communication and leadership skills to manage the processes of "creating the future." Originally conceived and formulated by Robert Dilts and Gino Bonissone as part of an extensive project on leadership and creativity for the Fiat Group, the purpose of Skills for the Future is to provide models and tools for defining and managing the creative process on both a micro and macro level. The micro aspects of creativity relate to the inner thoughts and subjective experiences that are at the basis of an individual's own personal creative activities. 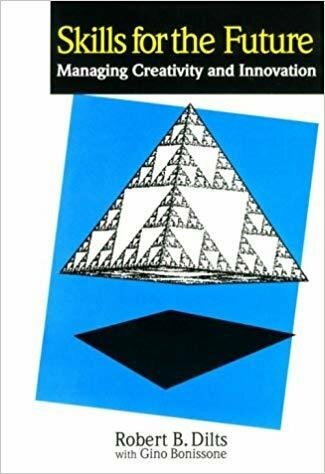 The macro aspects of creativity deal with a) how to enhance the creative interaction between two people or a group of people, and b) the implications of the creative process in the context of an organization and organizational problem-solving. The book is composed of three basic parts: 1) Personal Creativity, 2) Co-Creativity and 3) Group Creativity. Part I focuses on the personal or individual aspects of creativity and innovation. Its purpose is to address questions such as, "What are some of your own personal creative strategies?" "How could you define and enhance some of your own creative abilities?" Part I shows how some basic NLP models and distinctions may be used to develop more mastery over your internal state and improve your own creative thinking strategies by coordinating your own inner dreamer, realist and critic. Part II explores the processes relating to co-creativity. It addresses the questions, "How can we enhance creative interactions?" "In what ways might we be able to coach the process of creativity in others or stimulate others to be more creative?" Part II emphasizes skills related to helping others be more creative and tap into unconscious creative processes through mental mapping and lateral thinking strategies. Part III explores how NLP principles and tools may be used to stimulate and manage creativity in groups of people in organizations, in particular in terms of interfunctional interactions. It addresses questions such as, "How can the creative processes of different people be coordinated?" "In what ways can we define and integrate the different kinds of creative processes necessary to promote a successful team or organization?" Part III focuses on skills related to the identification and direction of different thinking styles and the development of effective communication strategies and creative leadership abilities.